Born and raised in Montreal, I spent all my summers in the Laurentians on the shores of Lake MacDonald. After many moves across Canada, my husband and I are back living at Lake MacDonald which provides me with lots of inspiration to paint my oils, watercolours and pastels. The great outdoors has always been my inspiration, the wonders of nature fascinate me and I have fun trying to interpret them in paint or pastels. 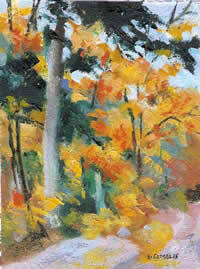 I particularly like the rich colour in pastel and find it a wonderful immediate medium to work with in the field. The pastel sticks can be manipulated to portray the abstract shapes and it is ideal for line work as well. Painting is "visual poetry" to me. I don't worry about the end result of a painting but just enjoy the process of painting itself. I enjoy choosing and mixing colours, the richness of the oil, the flow of the watercolour and the strokes and texture of pastel. It is similar to a meditation for me. My idea of heaven is sitting outdoors enjoying and painting nature on a day when the temperature is comfortable and the flies aren't around yet. Lately I have also been painting with Casein which is a milk based paint used before oil paints were discovered. It has to be used on a rigid surface to avoid cracking and can be rubbed to give it a shinier surface. However if the weather isn't favourable, (that can happen a lot in Canada) I work from sketches and photographs that I have done previously. There has been many juried exhibitions that I have participated in throughout Canada and two of my paintings are published in the book "The Best of Canadian Pastels". One of my paintings was displayed in the "International Artist Magazine" and another in the American publication "Plein Air". I have also been the recipient of many awards for my paintings in both Ontario and Quebec. I think that in order to try for the exceptional in your work, you have to take risks and understand that some of them will fall short. It's in the progress and recognizing our successes that we reach our potential. The life as we know it goes fast and so I urge you to get to know yourself. Determine what you want and communicate it to the ones you love. Don't let anyone else's idea of who you are get in the way of what you want to do with your life.